This holiday season, I decided to take part in an ornament exchange hosted by One Artsy Mama. I was lucky enough to be paired up with Kelly from Your Charmed Life. When partnered up, we were given a few bits of information about one another that might help us pick out/make the perfect ornament. Here is what Kelly said: "I love COLOR and lots of it! More Bling the better. I love: trees/banches/birds/owls/peacocks. I'd love something; colorful, glittery/sparkly, funky." I love how they turned out. They are 1) colorful 2) glittery/sparkly...they have lots of bling! 3) and they are tree related. I thought I covered a lot of what Kelly likes. Here is how I made them. I started with a trip to Michael's. I had an idea of what I wanted to get and then I stumbled into the "holiday" aisle and found these glittered fruits! The pears...turned upside down & disassembled a bit...looked like acorns! THEY WERE PERFECT...and half price! I bought a handful of them (as well as some other goodies - pine cones & greenery) and headed home. I planned on using the pinecone tops as the acorn top, but they ended up being really hard to cut (Adam even used some power tools). Once we got one cut, I didn't like how it looked on top of my acorn (I'll just have to find another project to use them on). PLAN B: crocheted acorn tops. I quickly crocheted a couple tops, looped some twine & greenery through the yarn and hot glued everything to the sparkly pears. 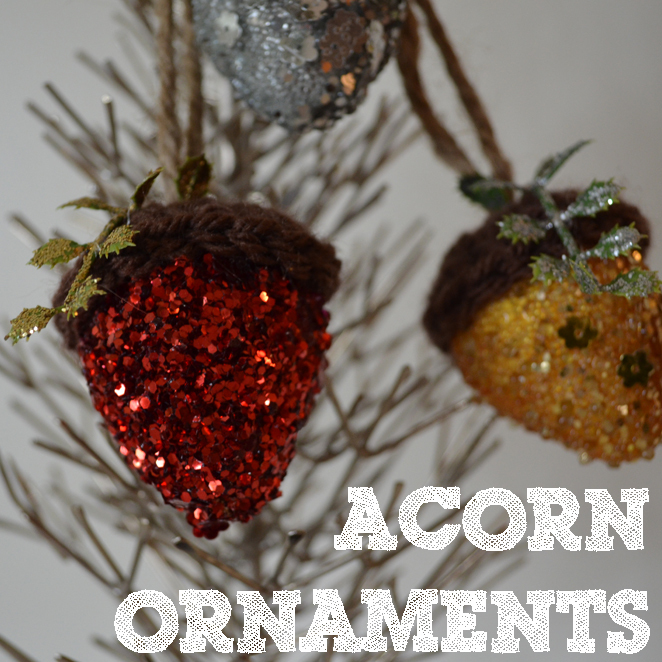 Now...instead of seeing pears...I see glittery acorns! I wrapped up all 3 of them and sent them off to Kelly. Kelly sent me this gorgeous ornament. I absolutely LOVE the tree and I love that is says Barefoot on it. Kelly makes so many pretty hand stamped jewelry items. Make sure you check out her Etsy shop! Love these, Shannon! So sparkly and festive! And I love the one Kelly sent you too...how fun! yay!! love the post and it was so fun doing this. I love ot see you made theses by hand it makes them that more special to me!! You did WONDERFUL and adore them, cant wait to get them hung on the tree this weekend. Look for my post as well, will be doing it here within the week. Anything glittery is fine by me! Love that you made pears into acorns! love acorns! and the sparklier the better. They are really so pretty! I am so impressed! I am sending mine to my partner today! But I am not so crafty! Very cute! Makes me wish I could crochet! Oh my goodness, I love those! Thanks for linking up at my Pin Me Linky Party. I hope you come visit & link again. The party starts tomorrow at 8am CST. These are so adorable. What a great idea! Thanks so much for sharing at "I Gotta Try That" Have a great weekend.